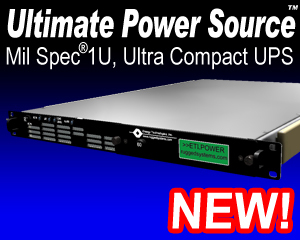 The field proven Rugged Systems™ Power Distribution Unit (PDU) line is ideally suited for military, industrial and telecommunicationsapplications requiring a rugged rack, vehicular or field deployable, high reliability, compact sizeand light weight design. The heavy-duty chassis occupies only 2U (3.5”) ofrack space while controlling up to 2400 VA of power via four double polecontrols. Therounded metal corners and rugged handles aid in safehandling. Internally, all major components are well secured and electricallyinsulated to prevent damage due to shock and vibration. All controlsand protective devices are brought to the front panel with critical switches orbreakers guarded. Further, all front panel devices are recessed to preventdamage or accidental operation. Thedisplay/control panel contains individual control switches, alarm silenceswitch and alarm LEDs. The LEDarrays keep the operator informed as to the unit's status. An alarm will flashits respective LED until acknowledged. Once the alarm reset is pressed, the LEDwill remain on steady until the alarm is cleared. The intelligent PDU allows control ofthe individual output circuits incorporating thermal and interlock interfacesfor additional control and safety, plus Battleshort override. Each loadcan have an external interlock toturn off power to equipment when it is not fully engaged in the rack or becomesoverheated. The rack may be equipped with both a thermal warning and a thermal shutdown sensor that thePDU uses to alarm and shut down all the loads to avoid damage or thermalrunaway. A Battleshort signalwill override both the thermal and interlock signals. An external CPU Fail orauxiliaryalarm signal can also brought in to annunciate. The display and controlpanel can be mounted remotely in the rack, or on the keyboard console, or on theunit front panel with only a logic level cable connection. The high intensity audible alarm can be heard in high noiseenvironments, yet is easily adjustable to suit quieter conditions. The double pole inputbreaker provides overload and short circuit protection for the connected loads. Theoptional Emergency Power Off (EPO) function can remotely open the input circuit breaker. Eachload is controlled by a double pole solidstate relay avoiding accidentaloperation due to shock or vibration. The elapsed time hour meter tracks therack equipment operation for maintenance. Therear panel provides locking connectors for the input power, output power, alarmand control signals. Appropriate jumper plugs are available for options notused in a particular rack system. Overall, the Rugged Power product line is uniquely qualified for critical shipboard,vehicle, airborne or land based systems combining advanced modular designfeatures with highly reliable construction.